Because we put YOU first! Why should you consider Memorable Indian Weddings amidst a plethora of other destination wedding planners? 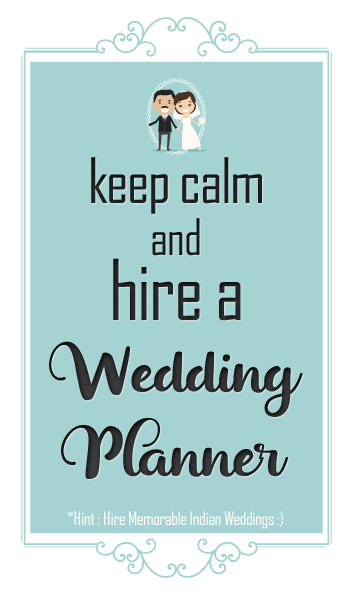 We do not have any rigid wedding planning strategies; we are a team of dynamic individuals with a bunch of ideas, which we aim to integrate to give you a personalized wedding. We provide infinite consultation sessions without hinting at you to pay token fee. Time is of essence and we value both your and our time. We would not cite punctured tires and late supplies as excuses because we like being bang on time and a moment lost is an opportunity lost. Our widespread network enables us to get the word done under the budget and on time. However, our prime focus is our clients and we work in their interest and not that of our associates’. That is why we present our clients with an unbiased opinion, we do not term hot scorching summer as sunk-kissed to just lure in more customers. Not just hotels, we believe in transparency in every domain. If we do not like a photographer’s work, we’d never recommend him, same goes for pretty much everything else. We understand that weddings create memories and we wouldn’t want yours to be scarred with souring flashbacks. Proudly being members of the Smartphone era, we are always available for communication, so you have any queries or doubts, just get in touch and we’d respond promptly. Our team of suppliers is dependent and trustworthy and hence we can guarantee prompt and par excellence services. Our work has been featured in BOHO wedding blogs and South Asian Bridal Magazine. We were also featured on Best Destination Wedding as one of the best destination wedding planners in India. We are in the trade for the love of it and a good wedding executed for us is another job well done. Smitten by the idea of Destination Wedding in India but not sure where to start from, fill up the form below and we will get in touch with you shortly.